Over the last couple of weeks the Nectarine Tree was treated for ‘Leaf-Curl. Now its hosting an infestation of black/brown Aphids!Gardening is probably not the best endeavour for people who lack patience! While I was out in the garden this afternoon, having a good chat with the Snow Peas (telling them to hurry up and flower), I noticed out of the corner of my that some of the buds on the tree were discoloured…. on closer inspection I thought the tree had a new disease to deal with. Then I saw the Ants! 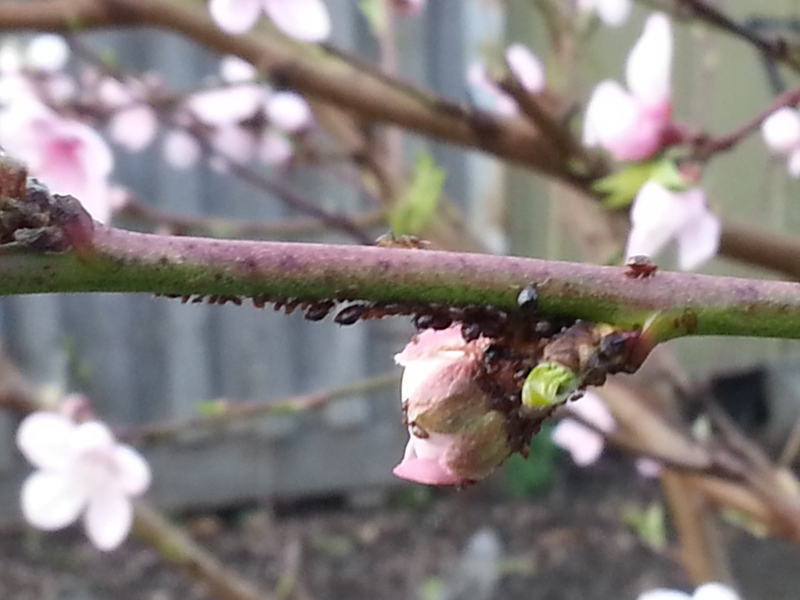 Ants are always a tell tale sign of Aphids. 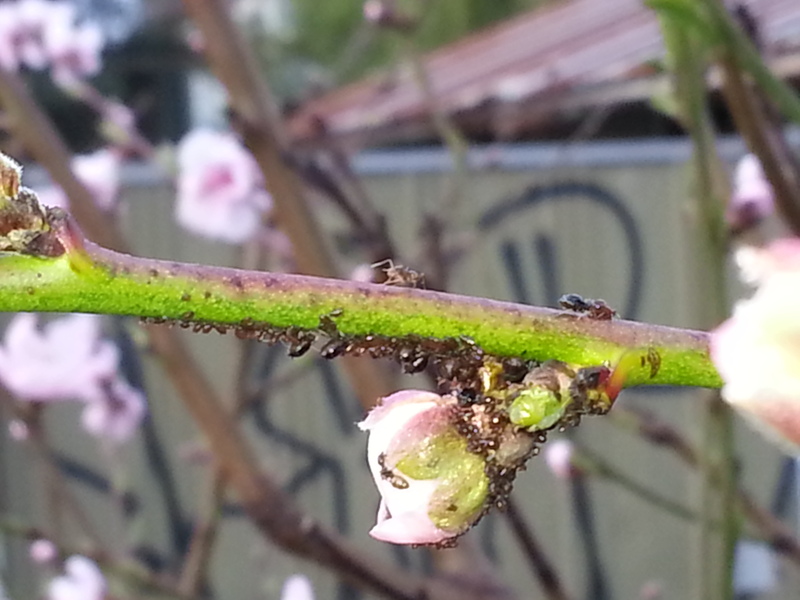 The Aphids eat the sap from new growth and buds and excrete ‘Honey-dew’. The ants then eat this honey dew. Ants will aggressively protect their food source and attack any Aphid predators like Lady Beetles, Hover Flies and Lace-Wings. During the ‘raid’ on the Reardon’s garden, thankfully a bottle of White-Oil made it into the plunder so I was able to treat this infestation straight away. Normally, my preference would be to let nature run its course or to treat aphids by splashing on soapy water… but this infestation has come on so quickly and heavily that i thought white oils was the best choice. There are 2 main types of horticultural oil on the market and sometimes both are sold as white oil. The difference is one is vegetable based and the other petroleum based. Be sure to read the label if this is important to you. Great post 🙂 I’ve been wondering why my citrus often has ants going rampant all over them. I thought they were being nice to the plant but obviously I was mistaken. I’m trialing letting my chickens deal with the situation. Prior to that I was washing the leaves with soapy water but not often enough, and it didn’t work. I’ll watch how the chickens deal with things and if they don’t solve it for me I’ll make a batch of white oil. Thanks for the information. Great blog! Be careful that your chickens don’t eat all the plant with the aphids! You could try buying some lady birds for your garden. … you can actually get them on amazon! (Not in Australia though).